To reduce your cost, Brandsport offers this item in Bulk (sold here individually). Gorilla also lists this same item in 4-piece sets as Display Package # 41127RD and Bag # 41127RDB. These Gorilla lug nuts are wheel and vehicle specific. 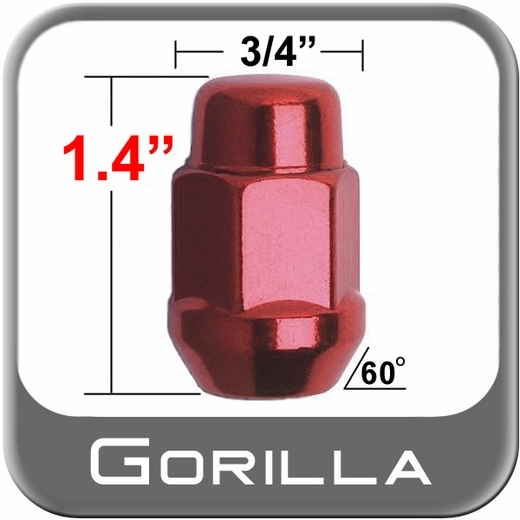 You will appreciate the long lasting quality of the Gorilla Red lug nuts. Easy replacement comes with the Gorilla Red lug nuts. Give the finished look to your wheels with a new set of Gorilla Red lug nuts.